From the 1950s onwards, our understanding of the formation and intracellular trafficking of membrane vesicles was informed by experiments in which cells were exposed to gold nanoparticles and their uptake and localisation, studied by electron microscopy. In the last decade, building on progress in the synthesis of gold nanoparticles and their controlled functionalisation with a large variety of biomolecules (DNA, peptides, polysaccharides), new applications have been proposed, including the imaging and sensing of intracellular events. Yet, as already demonstrated in the 1950s, uptake of nanoparticles results in confinement within an intracellular vesicle which in principle should preclude sensing of cytosolic events. 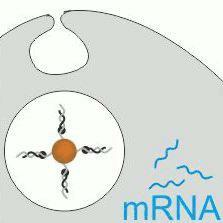 To study this apparent paradox, we focus on a commercially available nanoparticle probe that detects mRNA through the release of a fluorescently labelled oligonucleotide (unquenching the fluorescence) in the presence of the target mRNA. Using electron, fluorescence and photothermal microscopy, we show that the probes remain in endocytic compartments and that they do not report on mRNA level. We suggest that the validation of any nanoparticle-based probes for intracellular sensing should include a quantitative and thorough demonstration that the probes can reach the cytosolic compartment. Oligonucleotide-modified gold nanoparticles for intracellular gene regulation. We describe the use of gold nanoparticle-oligonucleotide complexes as intracellular gene regulation agents for the control of protein expression in cells. These oligonucleotide-modified nanoparticles have affinity constants for complementary nucleic acids that are higher than their unmodified oligonucleotide counterparts, are less susceptible to degradation by nuclease activity, exhibit greater than 99% cellular uptake, can introduce oligonucleotides at a higher effective concentration than conventional transfection agents, and are nontoxic to the cells under the conditions studied. By chemically tailoring the density of DNA bound to the surface of gold nanoparticles, we demonstrated a tunable gene knockdown. Endosomal escape pathways for delivery of biologicals. Despite continuous improvements in delivery systems, the development of methods for efficient and specific delivery of targeted therapeutic agents still remains an issue in biological treatments such as protein and gene therapy. The endocytic pathway is the major uptake mechanism of cells and any biological agents, such as DNA, siRNA and proteins. These agents become entrapped in endosomes and are degraded by specific enzymes in the lysosome. Thus, a limiting step in achieving an effective biological based therapy is to facilitate the endosomal escape and ensure cytosolic delivery of the therapeutics. Bacteria and viruses are pathogens which use different mechanisms to penetrate the membranes of their target cells and escape the endosomal pathway. Different mechanisms such as pore formation in the endosomal membrane, pH-buffering effect of protonable groups and fusion into the lipid bilayer of endosomes have been proposed to facilitate the endosomal escape. Several viral and bacterial proteins have been identified that are involved in this process. In addition, chemical agents and photochemical methods to rupture the endosomal membrane have been described. New synthetic biomimetic peptides and polymers with high efficacy in facilitating the endosomal escape, low pathogenicity and toxicity have been developed. Each strategy has different characteristics and challenges for designing the best agents and techniques to facilitate the endosomal escape are ongoing. In this review, several mechanisms and agents which are involved in endosomal escape are introduced. Copyright © 2010 Elsevier B.V. All rights reserved. Image-based analysis of lipid nanoparticle-mediated siRNA delivery, intracellular trafficking and endosomal escape. Delivery of short interfering RNAs (siRNAs) remains a key challenge in the development of RNA interference (RNAi) therapeutics. A better understanding of the mechanisms of siRNA cellular uptake, intracellular transport and endosomal release could critically contribute to the improvement of delivery methods. Here we monitored the uptake of lipid nanoparticles (LNPs) loaded with traceable siRNAs in different cell types in vitro and in mouse liver by quantitative fluorescence imaging and electron microscopy. We found that LNPs enter cells by both constitutive and inducible pathways in a cell type-specific manner using clathrin-mediated endocytosis as well as macropinocytosis. By directly detecting colloidal-gold particles conjugated to siRNAs, we estimated that escape of siRNAs from endosomes into the cytosol occurs at low efficiency (1-2%) and only during a limited window of time when the LNPs reside in a specific compartment sharing early and late endosomal characteristics. Our results provide insights into LNP-mediated siRNA delivery that can guide development of the next generation of delivery systems for RNAi therapeutics. Copyright statement: © 2015 Mason et al.